FamilySearch’s Family History Library celebrated its 30th Anniversary on October 23, 2015. The library has been recognized by genealogists as the top research and collections library in the world. Part of the reason is it seen that way is because it has evolved to keep up with the changing demographics and demands of family researchers. 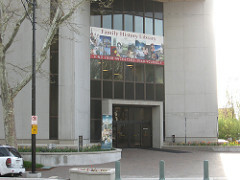 The Family History Library is located in downtown Salt Lake City, Utah. It was originally founded in 1894. and had two purposes. One was to gather genealogical records. The other was to assist members of The Church of Jesus Christ of Latter-day Saints with their family history and genealogical research. The library started out as a one-room repository of the Genealogical Society of Utah. Today, it is a five story building. The library also has a lab for testing discovery concepts that is called the Discovery Center. It is a family-friendly place designed to encourage young people to get involved in genealogy. The Family History Library is a service that is provided by the Church of Jesus Christ of Latter-day Saints, also known as the Mormon Church. Everyone is welcome to visit – no matter what their religion happen to be. It is open to the public at no charge. The Family History Library is the largest of it’s kind in the world. It is estimated that there have been 1,500 daily visits. Currently, there are 100 full-time and part-time professional staff who work at the library. In addition, there are approximately 700 trained volunteers who are there to assist genealogists with their family research. The Family History Library has a catalog of materials that can be searched online. Many of their materials are available to be loaned to local family history centers around the world. It does not appear that they can loan items to individuals, so it would be wise to find out where the closest family history library is before you attempt to have something sent there. About 25% of the 2.4 million rolls of microfilm that were stored at the Granite Mountain Vault have been digitally published online at FamilySearch.com. If you are unable to travel to the Family History Library, and do not have one nearby, you could make use of the FamilySearch website. There are records from the United States, Canada, the British Isles, Europe, Latin America, Asia, and Africa. The collection at the Family History Library includes over 2.4 million rolls of microfilmed genealogical resources. These resources take the form of 727,000 microfiche; 356,000 books, serials, and other formats; over 4,500 periodicals; and 3,725 electronic resources. The majority of the records in the Family History Library contain information about people who lived before 1930. Image by Jim Moore on Flickr.